The Wharfe Valley, although beautiful and vibrant, is not as steeped in brass banding tradition as other areas of Yorkshire nearby. In 2009 Otley Brass Band set itself a target to create a new tradition of Brass banding locally, so as to develop and protect the wonderful sound of the Brass Band. At the suggestion of the then MD Gordon Eddison (a local peripatetic music teacher) Otley Brass Band decided to form a development band to feed new blood into the main band. “Wharfe Brass” – named after the river flowing through Otley, was formed with nine members and older instruments from the band. A small Lottery Grant was obtained to support the new venture and three years on, over fifty players with ages ranging from 8 to “a little over retirement age” rehearse once a week under Andy Novell’s leadership. Wharfe Brass now performs as a band in its own right and has won classes in both the Rothwell and Wharfedale Music Festivals as well as sharing concerts with Otley Band. Wharfe Brass is featured on the latest CD recording of Otley Brass Band and can be heard playing “Royal Parade” – a festival march celebrating the recent jubilee of Her Majesty Queens Elizabeth 2, also ”Jurassic Park” and “Eye of the Tiger”. There is no formal “minimum standard” for new players of any age to join Wharfe Brass. It is suggested that interested players should make contact with Andy Novell the MD of the band through the website before coming down to The Courthouse. Wharfe Brass rehearses at Otley Old Courthouse from 6.30pm to 7.30pm during term times. Access to the premises is available from 6.15pm and it is expected that members to arrive promptly to allow a punctual start at 6.30pm. Facilities are available for non-players to wait during the rehearsal times. At 7.45pm Otley Brass Band rehearse in the same venue. Members of Wharfe Brass and parents, partners, etc. are very welcome to use the viewing gallery if they wish to listen. Wharfe Brass is focused on ensemble playing and developing musical skills as a group. As such private tuition will not be given, although details of tutors are available from the Musical Director if requested. Although Wharfe Brass is aimed at developing players, a basic musical proficiency is expected, a rough guideline, the player should be able to read simple sheet music and play an octave scale on their instrument. Otley Brass Band have implemented a Child Protection (Safeguarding) Policy throughout their organisation. This policy is available here and can be discussed with Otley Brass Association’s Child Protection Officer. Andy Novell has recently become the musical director of Wharfe Brass and Stepping Stones. He was originally taught by Gordon Eddison, the first musical director of Wharfe Brass. Andy attended Leeds College of Music before going on to study music at Newcastle University. As part of this he received a scholarship that allowed him to go and study at the University of Salzburg, in one of Europe’s most famed musical cities, for a year. During his time at university Andy has been a soloist many times including with the Newcastle Sinfonietta and Northumberland Orchestral society as well as playing principal trumpet for 3 of the universities ensembles. Currently Andy plays principal cornet for York Railway Institute Brass Band and flugelhorn for Otley Brass Band. 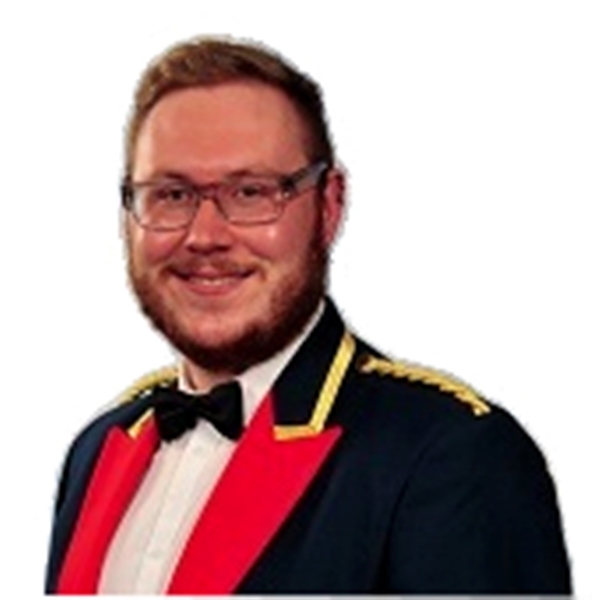 At present he is employed as a peripatetic brass teacher and Ensemble Director (at Selby Music Centre) meaning he has a great deal of experience working alongside musicians of various ages. Andy is looking forward to his future with the bands.